Cunard Cruises is a world-famous luxury cruise line, offering vacationers five star service, opulent ship decor, gourmet dining, spa services and unique entertainment. These ships are reminiscent of the golden era of cruising. 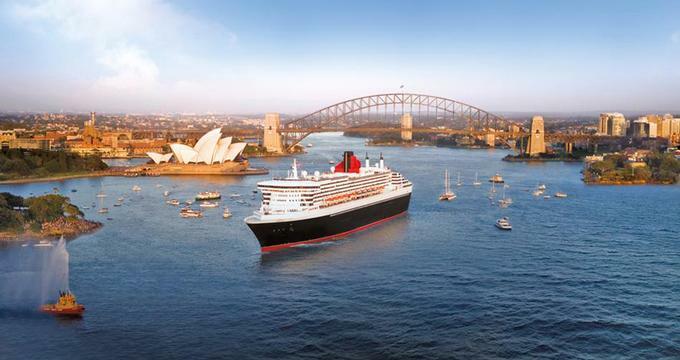 Plan a luxury trip aboard one of the three beautiful ships: Queen Mary 2, Queen Victoria and Queen Elizabeth. Cunard's ships offer unique attractions such as QM2's only planetarium at sea, Canyon Ranch Spa and luxury duplex apartments, as well as Queen Victoria's private theater boxes. Luxury pricing varies by destination and season. 6-day Transatlantic Crossings aboard QM2 start at about $950 USD per person. Queen Mary 2 is Cunard Cruise Line's $800-million flagship and one of the top luxury ships. The ship offers transatlantic crossings between New York and Southampton, allowing vacationers to experience the old-world-style cruising. QM2 also offers voyages to the Caribbean, Europe, Mediterranean, New England, Canada, and World itineraries. A 151,400 gross ton, 3,090-passenger ship, Queen Mary 2 has 78% outside staterooms. Choose from 10 restaurants, including the famous Todd English Restaurant. Queen Mary 2 houses a 20,000 square foot Canyon Ranch spa, offering an array of relaxing treatments. In the evening, watch unique entertainment at Royal Court Theatre. QM2 also features the world's only floating planetarium. 6-day Transatlantic Crossings aboard QM2 start at about $950 USD per person. The ship features unique duplex apartments called Balmoral, Windsor, Holyrood, Buckingham and Sandringham. Measuring between 1,566 and 2,249 square feet, each apartment offers spectacular ocean views through a two-story glass wall. Travelers also get to enjoy a balcony, an exercise area, two full marble bathrooms with both tub and shower and a guest bathroom with shower. Each duplex apartment includes a butler and access to the exclusive Queens Grill gourmet restaurant. The cruise line has teamed up with the famous Canyon Ranch to offers a 20,000 square foot spa and fitness center aboard the luxury ship. There are 24 treatment rooms, fitness center, relaxation lounge, Thermal Suite and Rasul Room. Guests get to enjoy a thalassotherapy pool with airbed recliner lounges, waterfall, whirlpool, neck fountains air tub and body massage jet benches and other features. This ship began sailing in December 2007. It features a dramatic three-tier Grand Lobby, elegant dining and a choice of stylish guest cabins and suites. The 800-seat Royal Court Theater is reminiscent of a grand West End theatre, offering private viewing boxes on the upper level. The ship has a grand conservatory, complete with a central fountain and greenery, retractable glass roof and movable glass wall to the open swimming pool. Cunard Royal Spa & Fitness Centre offers 13,000 square feet of space for wellness, fitness and relaxation. Plan a luxury world cruise with Cunard Cruises, the company that practically invented world cruising nearly a century ago. The very first world cruise was on a Cunard ocean liner, the Laconia. The company offers a selection of itineraries aboard its luxury ships. World Voyage options range from 86 days to a complete 103-day circumnavigation of the globe. Departures are available from New York, Fort Lauderdale and Los Angeles. 103-day itineraries with Cunard start from about $22,500 USD. Enjoy Mediterranean sailings aboard the regal Queen Mary 2, Queen Victoria and Queen Elizabeth. You'll get a chance to visit famous destinations such as Barcelona, Rome and Venice. Experience the quiet life on the islands off the coast Italy and Spain. Visit Corsica, Monaco, Croatia's Dalmatian Coast, Italy's breathtaking Amalfi Coast and more. Enjoy luxury dining, nightly entertainment and relaxing treatments at the Canyon Ranch Spa. 14-night itineraries are priced from about $3,500 per person.